Friday found us braving the 'prevailing' winds at the Franklin Falls Dam in Franklin. This flood control and recreation area is maintained by the Army Corp of Engineers. We met up with our old friend from Profile Falls, Natalie McCormack from the Corp. Natalie, who the children think is one of the coolest folks around, showed us the inside workings of the dam! Access is limited to this area of the dam - the area where the flood gates are controlled and the the 70 year old crane is housed! This shows the massive gear that is part of the lift system that controls the flood gates. 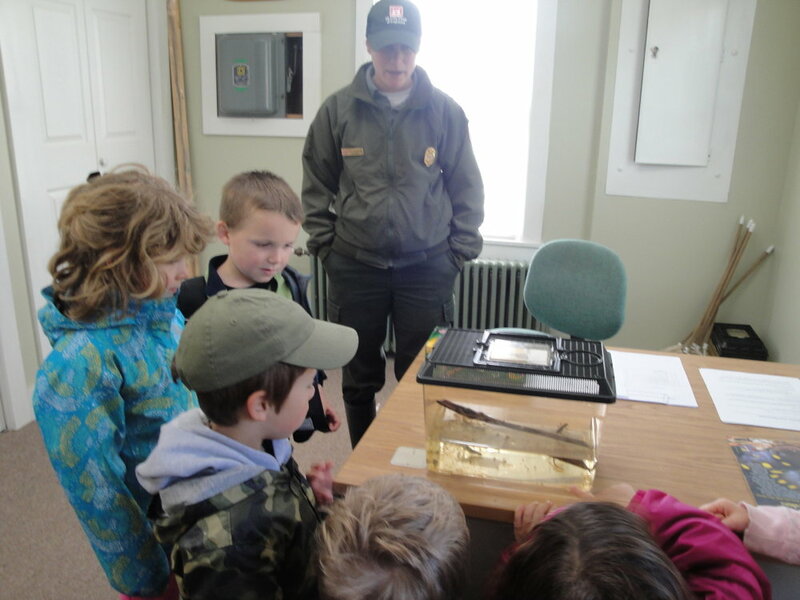 After a tour of the inside of the dam, Natalie took us out to a vernal pool to search for tadpoles, frogs and water bugs! 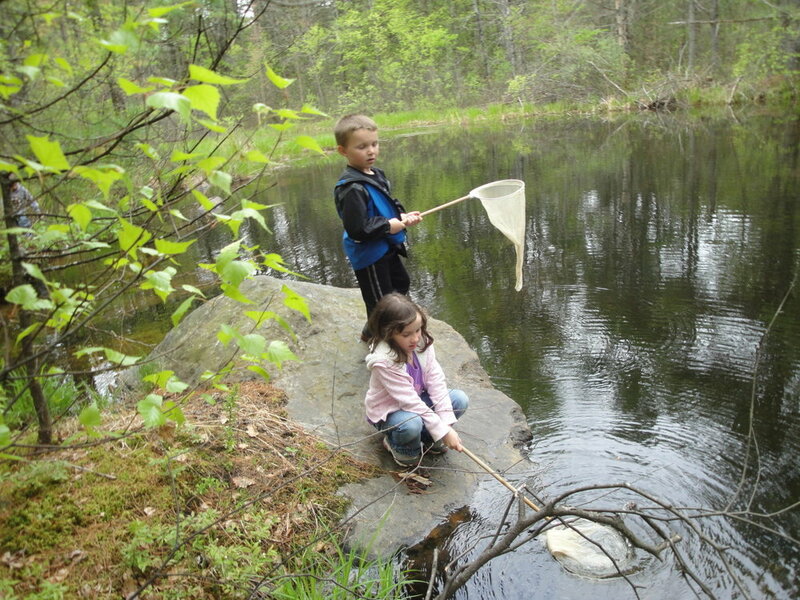 While we were not all that sucessfull locating tadpoles and frogs, the children still had a grand time investigating. The recent rain had greatly expanded the surface area in the pool, giving the creatures many more places to hide out! Here the children were investigating a newt and newt eggs gathered from a nearby pond. At the Activity Center, there are many native, stuffed animals that have been donated to the folks at the dam to use in educational talks. The kids were amazed to find out that a baby moose is as tall as them when it is born. I think that the dam was one of our best outings. It is such a great space for young children. They have a great playground and picnic area and miles of walking and bike trails in addition to the paved section out to the dam. I dream of spaces like that for our future home! 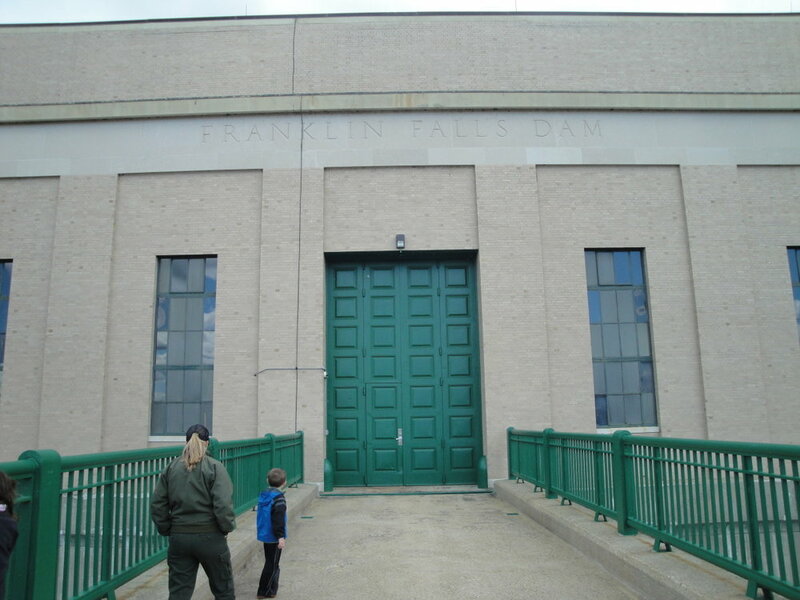 The kids would love to take you back to the dam and show you all around.